My daughters love caramel corn, but rarely do I buy it, since one of them has a peanut allergy. It is hard finding delicious, chocolate- covered popcorn that does not contain nuts and yet still has a good crunch. 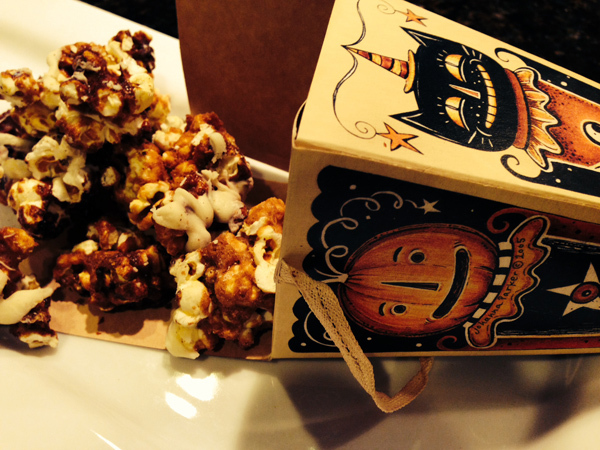 Here is a nut-free recipe for Chocolate Covered Caramel Corn that will do you proud. It is addictive from the first bite, and makes an adorable homemade treat for Halloween giving. I bought the cone-shaped boxes you see in the picture from www.fancyflours.com. Stir in corn syrup, sugar and salt and cook until sugar dissolves. Give the sugar one more stir and then raise the heat to high. Boil the sugar without stirring until a candy thermometer registers 248 degrees. Remove from heat and stir in the baking soda. Immediately pour the caramel over the popcorn and stir to coat thoroughly. Transfer to two parchment lined baking sheets and spread the popcorn in a single layer on each tray. Bake for 30 minutes stirring twice during the baking process. Place the white chocolate in a microwave safe bowl and microwave in 30-second intervals stirring at each interval. When the chocolate is beginning to melt, remove from the microwave and stir until thoroughly smooth. Drizzle the chocolate over the popcorn and let set for 30 minutes. Break up the popcorn with your hands and place in airtight container.